More in The Big Issue magazine. So I was in heat 4 of Celebrity Masterchef 2015. As the hack in the pack alongside actual showbiz celebrities (Dancer Natalie Lowe, presenter Keith Chegwin, actor Scott Maslen and The Wanted singer Tom Parker) it was an irresistible chance to see how the show works and gather some stories. Not least the horror of hearing about the strange dance with the devil that can be a celebrity’s relationship with the tabloid press. And yes, I do love cooking and the feminist history of women’s relationship with the kitchen. I grew up watching all that 70s telly: The Galloping Gourmet, Delia, Nanette Newman’s Fun Food Factory, even the processed 70s “snacks” involving pineapple chunks and white bread that they made on Why Don’t You…? And of course my mum Lalita Ahmed cooking on Pebble Mill At One, (precursor to This Morning) and coming home with photos of her with Sasha Distel and similar sofa sharing luminaries and writing cook books. I’ve also been collecting cookbooks from the 1950s onwards for years. 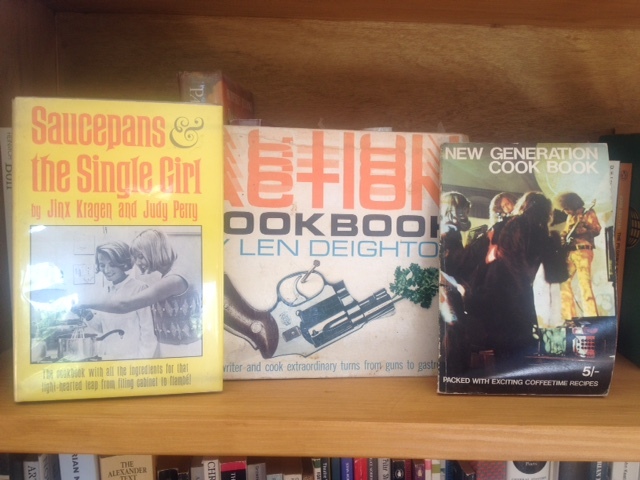 They include such 60s gems as Len Deighton’s Action Cookbook, Saucepans and the Single Girl and (a personal favourite) The New Generation Cook Book, in which recipes are linked by a story about a young female researcher working on a Top of the Pops type TV show. From the off it was clear that the Celebrity Masterchef standard and ambition was high. Natalie did everything you’re supposed to do: Be bold and experiment and she knows her grilling. They were all very sweet and fun to hang out with. Cheggers wizzed up some beautiful desserts and sauces. Tom is very modest but seriously able. Scott is the standout and my bet for a potential winner. And I don’t know having not seen beyond my heat. And I scared myself. Don’t cook with me is all I can say. In The Big Issue next week you’ll get the full story on my identity crisis as a career woman who’s never sought to be judged on an old style “feminine” skill like cooking. And as one who attempted the kind of basic Indian home cooking (the chappatis, oh god the chappatis) that if you’re going to cook you should have been cooking for years and mastered before attempting it on national television. And for Christine Hamilton at that. Luckily my mum is abroad for the whole of July. I take the chance to apologise now to the entire nation of Asian mums and aunties for Letting The Side Down. The best experiences were cooking up the challenges in the studio kitchen with tofu and chocolate or squid. And especially being in the Almeida Restaurant kitchen run by a very impressive young Scottish chef Tommy Boland. I can’t tell you what an adrenalin high that day was. He is a chef to watch. I think what I really wanted was to be taught elite stuff. There was a pastry chef in the Almeida cooking 3 different desserts and loaves of fresh bread from scratch over the course of the morning. I’d liked to have shadowed him for a day. Behavioural psychologists can debate the performance/show off element of the Masterchef format that so many men seem to do well at. Looking back I made all the classic errors of some other women I’d watched on previous series: competent home cooks who aren’t naturally big risk takers and who made the mistake of trying to be safe and cook what they or their families like. I’m not making excuses. My heart wasn’t in it to give what was needed. But it was great fun and I think Tom and Scott were totally obvious and deserving heat winners. The roasted veg couscous with harissa and feta cheese from episode 7 was adapted from Nigel Slater’s Real Cooking. I make this in big quantities for parties. That rhubarb ginger sponge pudding of mine (episode 8) is a favourite of all my friends. Give it a try. It’s in the Margaret Costa Four Seasons cookbook. The chocolate brownies (relay challenge episode 8) were based on the pudding I’ve made more than any other in my life: From Rose Elliott’s Vegetarian Dishes of the World (one of my most beloved and best used cookbooks). I use redcurrants, raisins, or cranberries instead of the nuts usually stated in such recipes. The berries give a lovely sourness against the sweet dark chocolate. Serve with a big dollop of greek yoghurt or creme fraiche. Eat them warm or if you refrigerate the brownies after they cool, they taste even nicer I think. My BBC TV Blogpost on How To Survive Celebrity Masterchef (Jul 2nd)– Oh the irony. It’s filled with clues as to the outcome. This entry was posted in Books, Food/Drink, Media, TV and tagged celebrity masterchef, masterchef. Bookmark the permalink.